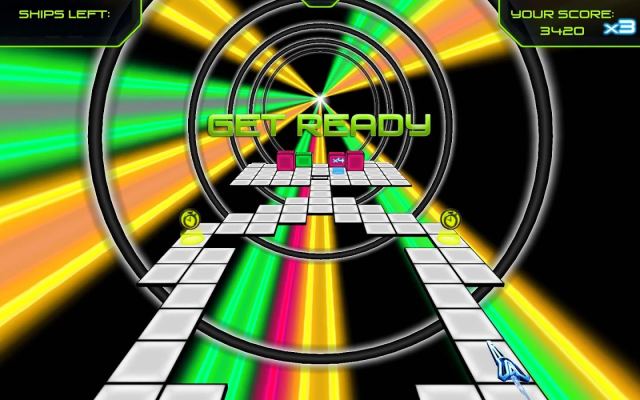 Apparently I’m in a mood for colourful, geometric infinite runners at the moment, and after yesterday’s review of Spheroid Cyclone I’m going to follow it up with Avoid – Sensory Overload, which I can only describe as falling down a psychedelic well made of insane. Fun, in other words, lots of it. Also in 3D, and also set inside an infinitely long cylinder, Avoid goes a slightly different route of having you set on a flat plane, the cylinder being purely scenery. By limiting you to left-right motion Avoid actually goes very old school and is, at heart, an “avoid the falling blocks” game. And it does so superbly. The music is great, varied enough to keep it from getting repetitive while never getting in the way of the game. It doesn’t achieve the pure kinetic synergy of Super Hexagon’s music but what does? The graphics are crisp and smooth and most importantly the game hasn’t yet felt unfair, and every time I die I know it’s my fault. And I die a lot. Where Avoid separates itself from the obvious comparisons is by having different game modes and by introducing new mechanics as you rise through the difficulty levels. On easy you start moving cautiously, the score crawling up almost painfully slowly, and it takes minutes before your little avatar is belting along and racking up the big numbers. Harder difficulties start much faster and offer more challenging obstacles, more unforgiving layouts. But where the game falls down for me is in the new mechanics introduced in harder difficulties. On easy you have three kinds of obstacle – holes in the floor, raised blocks and dots that drift from side to side – and four kinds of power-up – a shield, a score multiplier, something that lowers all raised blocks in view and something that fills in all holes in view. These offer just enough variety to keep the run interesting, though score-multipliers are the only real necessity. Shields offer a nice temporary bit of protection against a collision with a block, but thanks to the randomly generated layouts the raise/lower power-ups are rarely worth going out of your way for. On harder difficulties though it turns into more of a shooter. There is a powerup that gives you a gun that auto-fires for several seconds destroying anything in your path, and there are missiles that sit statically in front of you until you get close and then accelerating down the screen. All of which serve to change the tone of the game, taking it in a direction I can’t honestly say I enjoy. The easy difficulty provides a purer, more immersive experience that has me going back for more again and again, while the harder difficulties feel more like a cheap 90s arcade game. This is a shame since the easy mode is just a little too slow to have that “one more try” compulsion. Where Super Hexagon and Spheroid Cyclone take mere seconds to challenge your high score Avoid needs an investment of minutes. For this type of game it doesn’t quite work. Avoid – Sensory Overload is developed by NuOxygen and is available on Google Play and the Apple App Store.